You can't really say that you've seen the Amalfi Coast until you've seen it by sea. From the water, the colorful fishing villages tumbling down the cliffside to the shore are particularly picturesque, and the rugged coastline unforgettably dramatic. On a boat trip along the Amalfi Coast, you can savour the thousand shades of blue and turquoise of the Mediterranean waters along the coastline from up close, stopping for a swim in a hidden cove or setting sail to the island of Capri. Explore the Amalfi Coast by sea! 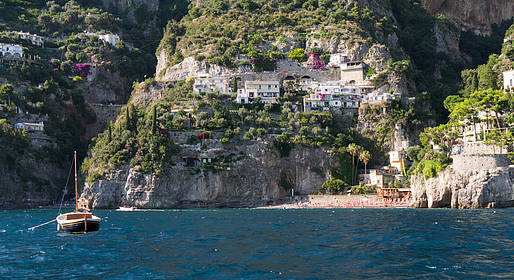 Here is how you can arrange a boat tour or rental in Positano and Amalfi. 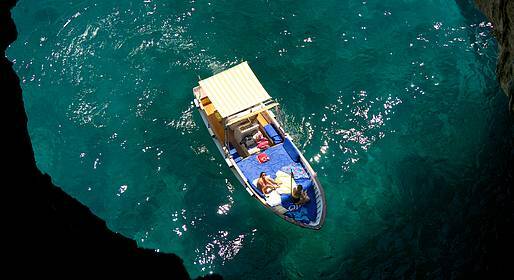 You can rent a boat with or without a skipper in all the towns along the Amalfi Coast. We suggest you opt for a boat rental with skipper or an organized boat tour if you do not have any experience at sea. Do I need a boating license to rent a boat in Positano without a skipper? For most of the boats available for rental in Positano, you do not need a boating license. However, we suggest that you have at least some experience at sea if you choose to rent a boat without a skipper as the currents along the Amalfi Coast can be tricky. What is a semi-private or shared tour? These tours use a wooden gozzo which can fit up to 12 passengers, so each passenger pays a portion of the rental cost for the entire boat rental with skipper. What is a water taxi? Often, the fastest way to travel from one village on the Amalfi Coast to another is by water. In the summer, a number of small boats and ferries make runs between the beaches and waterfront restaurants that are only accessible by sea. These transfers cost just a few euros, and is free for restaurant patrons. How long does the boat trip take between Positano and Capri? With an average sized boat, it takes a bit more than 30 minutes. Can tourists visit the Li Galli islets off the shore of Positano? No, sono isole private, è possibile però fermarsi con la barca al largo per fare un tuffo.